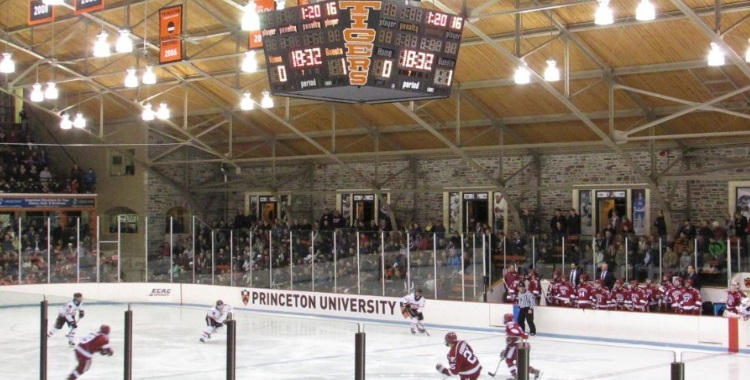 PRINCETON, NJ- In a strange game Saturday night at Hobey Baker rink, the Harvard Crimson defeated the Princeton Tigers 3-0, though that score is misleading as the visitors picked up their last two goals into an empty net in the waning minute and a half of the game. Goaltending was a major story in the game as Harvard’s Merrick Madsen shut out the Tigers effectively throughout the periods despite some credible chances. Princeton’s Colton Phinney kept his team in the game throughout giving up one lone goal in the first and shutting out a team that came into the weekend ranked as one of the nation’s best for the rest of the game. In the first period Harvard dominated. It wasn’t even close. The Crimson were in the Princeton zone launching puck after puck at Phinney with the Tiger defense being unable to stop them. The Crimson were even completing pass combinations as if there wasn’t a defense at all. Despite that only Jimmy Vesey scored. Desmond Bergin was at the top of the zone and slapped it and the puck went off Vesey through Phinney’s pads at 5:47. An assist also went to Alexander Kerfoot. During the tumultuous period, Kyle Criscuolo, Luke Esposito, and Devin Tringale were among those that had chances for Harvard. Princeton actually came up with a few threats late, but to no avail. At the end of 1 it was 15 shots for Harvard and 7 for the Tigers. In periods 2 and 3, Princeton corrected whatever was ailing them and really gave Harvard a hard time. The Crimson did not have the same opportunities they had in the first and the game evened out quite a lot. Each side had their chances but neither goalie let any pucks in. With nearly no time left and down 1 in the third, Phinney went to the bench, though Harvard’s Clay Anderson scored almost instantly, assisted by Michael Floodstrand at 19:04. The Tigers called a time out and pulled Phinney again giving the extra man attack a continued try. The plan backfired in a sense as Harvard’s Alexander Kerfoot lofted another puck into the net, but on the other hand the Tigers really had little to lose. Vesey and Madsen picked up the assists on the goal. Phinney in addition to being stellar in goal also had a ridiculous kick save. Eric Robinson and Ryan Kuffner both impressed me as they were all over the ice trying to make things happen. Statwise, Madsen had 38 saves on every Princeton shot and Phinney had 39 on the 40 shots he faced as Harvard took 42 total. Each team was 0 for 3 on the power play on the evening. With the win Harvard is 4-1-1 overall and in ECAC hockey, and 4-0-1 in the Ivy League. Princeton is 1-5-0 (0-4-0 in ECAC Hockey and 0-3-0 in the Ivy League). With Berlin in the box, Robinson broke in on a short handed try, and Princeton’s Garrett Skrbich also blocked a shot. Princeton’s Joe Grabowski broke up a Harvard sweep into the zone. Tringale intercepted a pass of Princeton’s but no harm followed. Princeton’s Kuffner came up with a nice breakaway before Madsen snuffed it out. Jonathan Liau had a blocked shot. Harvard’s Ryan Donato intercepted several Princeton passes. Bergin intercepted a Princeton pass, though the team survived this too. Robinson stole the puck from Harvard and took it up ice for a shot, but Madsen stopped it. David Hallisey had a really good opportunity close to Madsen but he couldn’t on during the last seconds of his approach. Kuffner retrieved a Harvard puck and raced in only to launch the shot aerial. Skrbich got perfectly set up on a shot but Madsen denied him. Kuffner had another chance and used some good stick handling before Madsen brought an end to the attack. Ryan Veronneau fed Riche nicely but Madsen also stopped the attempt. Later, Robinson skirted around the net but was beaten by the keeper as well. Veronneau used stick handling while basically standing in one place to avoid a pair of Harvard defenders trying to set up an entry, but offsides was the result. During a Harvard Penalty Olson cleared it. Phinney saved a one timer by Tyler Moy, and later defeated Vesey when he swept in front and tried a backhand. On a Princeton Penalty, Skrbich cleared it after a Harvard effort. Robinson also brought it out of the zone as he did often in the game. Vesey was extremely difficult to stop on a break but the Tigers eventually corralled him. Later Wiley Sherman launched a big shot but was stopped cold. Princeton’s Quin Pompi had a blocked shot which set up a Princeton break. During a dangerous Harvard attack, Phinney had a big pad save. The Crimson would try to strike again but Robinson got it out of danger. Princeton’s Ryan Siiro slipped in front of the keeper but was also stopped by Madsen. On a Harvard power play, Esposito tried again but a glove save from Phinney ended that. After Ambrosia shot it on Madsen, Riche got the rebound but that also was saved.